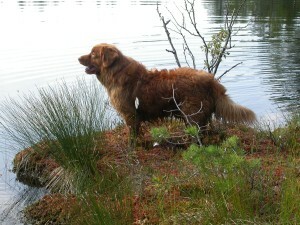 As soon as the children were out of the rough and we were sure that it had to be a Toller, we started looking for a breeder. We wanted a family-friendly dog (whatever that maybe?! ), who could participate in all outdoor activities. In Germany they hadn`t started breeding the breed, in Austria they also weren`t ready. We got lucky in Switzerland. We waited two years for our �gold piece� and that was good! Elsbeth brought us our 10 week old puppy; small, chubby and furry. Just like puppies are he turned everything upside down. We took him to puppy classes with Ute Narewski in Reutlingen. 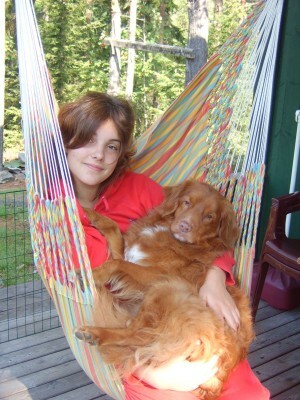 Youngster classes weren`t offered yet, 9 months later training for the companion dog test started. 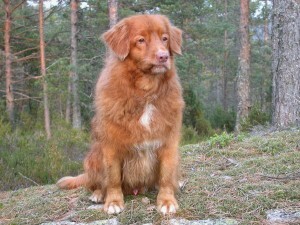 There he was the first Toller the trainer ever had in a group. The same applied in our dummy course. Very soon it turned out the Baloo could count to three, more dummies didn`t exist for him in the high-lost. He didn`t retrieve furred game, because when he tried to carry our cat a �NO!!! !� was screamed, so why should he carry rabbit?! Unfamiliar dummies stayed untried. 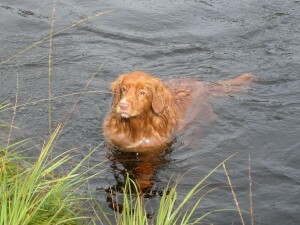 It was and remained hard with such a sensible, stubborn dog. He couldn`t stay alone for a long time, he accepted it later on with Tuffy. He preferred the whole family around him. He took a delight in everything the children did with him, especially going for a sniff around the neighborhood. At the age of 12 his motor functions weren�t that good anymore and also his sense of hearing tuned out once in a while. In the end of March 2006 his left kidney had to be removed in an emergency operation. He got over this life-threatening situation. He even mastered a left sided paralysis (a stroke due to a high lost of blood), after all his girls would be in heat in April, so he had to get back on his feet. In our mini-pack he was the action-man. Tuffy told him what to do and he carried it out. He owed many fights to her. As soon as food was involved he wasn`t pleasurable and he loved baby mush until the end. We are glad that we had him! In the meantime he has left us and only now do we know what big of a hole he left behind. It wasn`t always easy with him, but he had so many qualities! He kept his girls together; he was the balanced factor in their midst, the favorite of all visitors and a clown in every situation of life. Farewell Baloo � you have been a good boy! A first reserved, a little sensitive, stubborn dog, who twisted his family around his little finger. 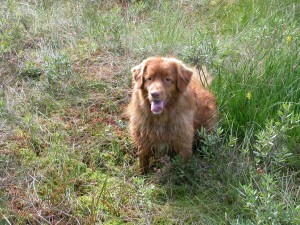 The 29 month old Toller-male has temper and a good drive. The bond to his handler and owner is excellent and couldn�t be better. 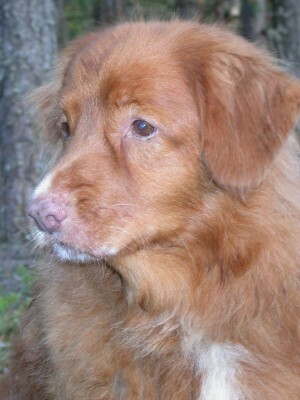 This Toller is very playful. During the walk he requests a game. He was very trusting to strangers. Retrieving instincts were visible, hardness wasn�t noticeable. During the test he was certain and unimpressed. The small, friendly Toller-male is steady to shoot.